Come to Expedition NEXT at the Maassilo in Rotterdam on Thursday 2 May during the May holidays. An event for children and adults full of experiments, lectures and expeditions: in 10 hours 100 scientists and researchers from throughout the Netherlands will come together to share their research with the public. During the day, children can fire their questions at YouTuber Dylan Haegens and scientist Esther Roozendaal about misleading adverts, follow mini-lectures by astronaut André Kuipers or physicist Diederik Jekel and perform tests with experiment expert Boy van Quest Junior. Meanwhile, parents can learn about a range of topics, such as the effects of smartphone use or the behaviour of children or teenagers and in the evening there are talk shows from, for example, New Scientist and Universiteit van Nederland for young people. Tickets are free for the children under 18, and for adults, they are 5 euros, including two free consumption coins. At the Science Fair children can do their own tests, take part in experiments and pose all their questions to hundreds of scientists who will show their research in one of the labs. They can also discover the food of the future, experience what happens in a courtroom or learn what black holes are in a mobile planetarium. For parents and grandparents, there is also enough to do and learn. For example, how do you protect children against cyber criminality and just how bad is it to sleep next to your smartphone? Which risks do teenagers take and should that worry you? In brief: the chance to ask an expert all your questions! In the evening, there is a programme in Club NOW&WOW where visitors together with top scientists, artists and journalists can enjoy a drink and discuss the science that will determine our future. In the talk show from New Scientist – LIVE, science journalist Martijn van Calmthout will talk to guests such as Ivo van Vulpen and Jaap Seidell about essential questions concerning the contribution of science to feeding the 10 billion mouths in the world and what the computer power of quantum computers will mean for our future. At Universiteit van Nederland – LIVE visitors will learn everything they need to know about falling asleep and , and how they can retain eternal youth. Subsequently, they can jump into bed with Eveline van Rijswijk and six young scientists for some light-hearted pillow talk. Had enough of talking? Then young people can enjoy concerts where science meets music, such as Music by Oceans. Jacco Gardner will close the evening in style by taking everybody with him into the world of astronomy with his psychedelic music. 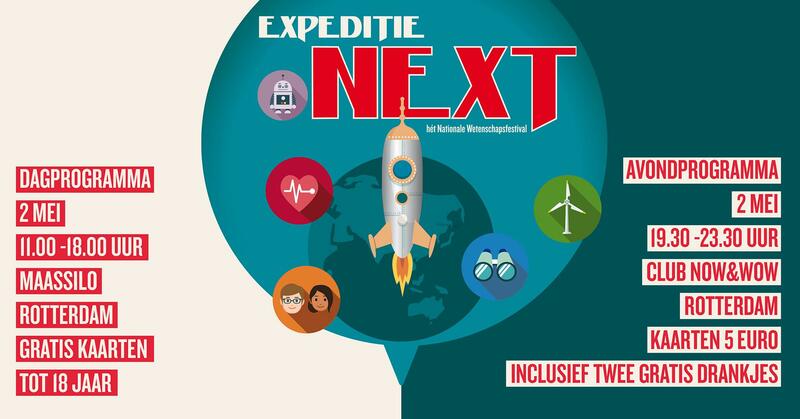 Expedition NEXT is an initiative of the Dutch National Research Agenda. This programme includes science communication and outreach activities. The Dutch National Research Agenda programme was established by the Ministry of Education, Culture and Science and is realised by the Netherlands Organisation for Scientific Research. The Dutch National Research Agenda brings public, stakeholders and scientists together to identify issues, realise research projects, involve society in research, and actively share the acquired knowledge with society. With Expedition NEXT, the Dutch National Research Agenda wants to show Dutch citizens how close science is to their everyday lives, how important it is for our society and how progressive the science climate in the Netherlands is.